I feel like it was just yesterday when my daughter wrote this post about getting her braces on. Wow, time sure does fly by, because this week, she got her braces off! She was so thrilled, she had been looking forward to the date for months. She actually did quite well with the braces, but there were certain foods that she was really missing…popcorn and caramel. It was hilarious when she came out to see me for the first time at the orthodontist’s office, with a bag of caramel corn in her hand. Yes, the orthodontist gives it out as a present when you get your braces off! She had a big beautiful smile on her face. On another note, if you have been following my blog, you know that I won the Girl Scouts of Western Washington Recipe Contest for the Samoas 40th Birthday. I was actually on local television this week to demonstrate the recipe. That was quite something, let me tell you – the usual host was on vacation, so these other two hosts were filling in. No one told me that one of them was a big jokester, so needless to say, I was quite surprised with some of the antics. Fortunately I was able to stay composed…but I was freaking out, hoping that no one would notice. You can check it out here if you are interested. Now for the exciting news – as I mentioned in my previous post, I will be donating my prize money to charity. Thanks to all of you who wrote in your favorite organizations. I decided to split the winnings between two charities – and I randomly selected the following: PANCAN and Imerman Angels. Both charities will each receive a $250 donation!! Thanks Girl Scouts for the opportunity! Coat a rimmed baking sheet with butter; set aside. Combine popcorn and peanuts in a large mixing bowl. Bring sugar, corn syrup, and 2 tablespoons water to boil in a medium saucepan, stirring to dissolve sugar. Add 6 tablespoons butter and stir until melted. Continue cooking, stirring often, until caramel is a deep amber color, 10-12 minutes. Working quickly, pour caramel over popcorn and peanuts and, using a heatproof spatula, mix to coat. Transfer to prepared baking sheet and let cool completely. Break into pieces. So exciting for your daughter to get her braces off and be able to devour this amazing looking popcorn! 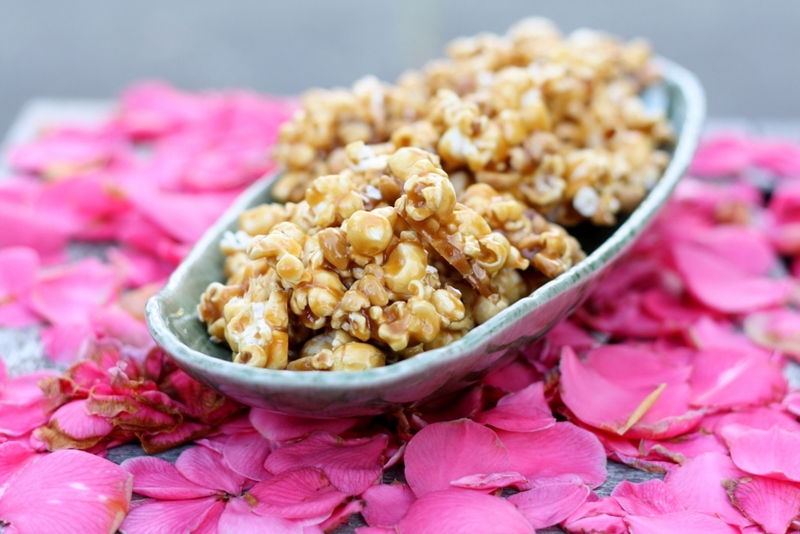 I’m a huge caramel corn fan and this looks totally delicious. Dawn, you are charming and the perfect little TV show host. You had me laughing but made me hungry at the same time. I see why you won this contest as this cookie pie looks outstanding. I am so proud of you!!! congrats to your daughter as that is a big triumph to get those braces off and enjoy some of moms delicious caramel corn.